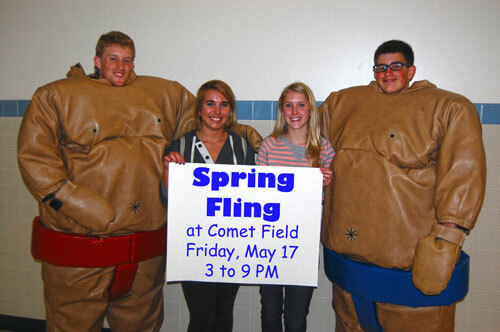 Spring Fling, the annual community carnival, will be held at Comet Field on Friday, May 17 from 3 pm to 9:00 pm. This event is planned by Penn Manor High School students for the enjoyment of the entire Penn Manor community. Everyone is invited! High school bands and soloists will be taking to the stage to provide live entertainment from 4 pm to 9 pm. High school sports teams and extra-curricular groups will have booths with carnival games and lots of different types of food. Amusement rides and inflatables will also be featured. New this year – a hot dog and a watermelon eating contest, a car smash and a make-your-own sundae bar! Fireworks will close the event and will begin at 9:00 pm. There is no charge to attend this event and the parking is free. The event will be held rain or shine. Pictured from left to right – senior class coordinators Adam Hess and Savannah Blake; junior class interns Alissa Herr and Brad Seiger.